The death of Arafat Rahman Koko was sudden and unexpected. Most regular citizens, not actively involved in either party’s political programs, probably forgot this name for a while. Busy with our daily struggles, we were not thinking: How is Koko Rahman? Where is he living? How do his days pass? A certain invisibility, paired with an odd hyper-visibility, was possibly the fate of being the younger sibling to the more prominent older brother. In recent years, all eyes were on Tarique Rahman: What will Tarique say next? How will government react? Will he come back to Bangladesh? Will government arrest him? These questions circulated in social media, varsity campus, talk show, shushil private conversations. In the midst of it all, the life of Koko was forgotten. During one of the many hartals of 2006, official television broadcast scenes from an amateur cricket match being played inside Hawa Bhavan. The point was to show that things were normal, although it only reinforced the impression of Hawa Bhavan as a zone of exception, a barricaded fortress. The cricket batting was led by Tarique Rahman. In one corner, Koko Rahman could be seen sitting on a chair, talking to someone. The younger brother, on whom the cameras lingered less often. Then 1/11 came and the jailing of both brothers paradoxically elevated Koko in the national imaginary. Now both brothers were seen as X factors, people who mattered– otherwise why jail both of them? The cricket match of national politics/ warfare wasn’t a spectator sport. Critics pointed out that Arafat Rahman Koko wasn’t a spectator anyway. Later when the 1/11 government started collapsing, the jail-to-court appearances of both brothers became a major political focus. The few glimpses on television, and the reams of writing in newspapers pivoted on the question of their health. The answer tilted based on whether one believed the Caretaker Government was abusing them or not. For Tarique Rahman, discussion rotated around medical reports that showed two fractured discs, D6 and D7 [Rahnuma Ahmed, “Tortured Truths,” New Age, 26th June 2008]. The Caretaker Government’s spokespeople claimed this was an old ailment, the BNP claimed it was from beatings he received in jail. Many could not imagine that his jailors, even in the early days of CTG, would dare torture Tarique Rahman. Even an army officer three decades removed from the 1970s must have some fear of reprisal? Or did they not? Perhaps this was the new world. Koko was a more complicated case. He was in visible physical distress at court hearings. In one TV footage, he was seen having a seizure inside the ambulance. An oxygen mask was clamped on his face, while cameras hungrily rolled on. Critics claimed the reasons for his illness predated his jail time. The matter remained an unresolved debate. Of the two brothers, Koko clearly seemed more physically unwell during court hearings. When it was announced that both brothers were going abroad for medical treatment, it was understood that Koko needed more treatment. In the national drama of blow-counterblow between AL and BNP, if you are not an active player, people tend to forget you. Koko was invisible in exile, while Tarique spoke up. The average citizen stopped thinking about Koko. Perhaps until this unexpected early death. Koko’s death is a private tragedy for the family. But is privacy possible for one of Bangladesh’s two ruling political families– both cursed by varying histories of sudden death? Our national political culture won’t allow it. Perhaps the families themselves don’t know how to inhabit such spaces of grief. Is private grieving even possible in a time of daily national deaths that are caused by the two families’ refusal to speak to each other? All events since the death have been turned into public talking points. Will Khaleda Zia call off the blockade? How long did Sheikh Hasina wait at gate? Will the body come back to Dhaka? Why is this death more important than burning deaths from blockade? And, a question that I am sure is on the government’s mind at least: Will Tarique come to Dhaka for the funeral? And if so, then what? Because of the particularly bitter political moment within which Arafat Rahman’s death has come, this will not be– indeed cannot be– a private death. I was looking at an old photograph of the Zia family. This was probably taken in 1979 or 1980.I do not know who the photographer is; it may be an official photo, or for a magazine. The children are small, wearing those familiar half pants from our youth (a reminder that whoever they became, before all that, they were children). 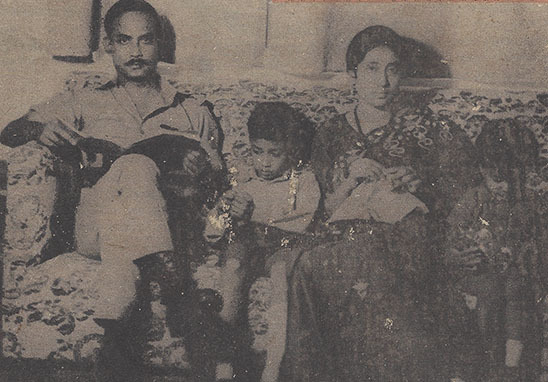 Ziaur Rahman holds a magazine, and his two sons have books open on their lap. Tarique Rahman is looking at the camera, Arafat Rahman is looking down at his book. Khaleda Zia appears to be knitting. The photo is possibly staged, although with elements that must have existed in that household– although perhaps not in that exact domestic configuration. The decision to present that tableau suggests certain ascribed roles. The stern father, the studious boys, the dutiful wife. The family that the photographer imagined was shattered to pieces by the events of 1981– Bangladesh’s second assassination of a head of state in the ten years since independence. I look at this photograph and wonder about the inner world of these two families that dominate our national politics– the Sheikh Mujibur Rahman and the Ziaur Rahman families. Have they ever had, or will they ever have again, any private moments? Very well written. I would like to write for you guys if that’s possible.